It seems like there has been a sudden surge in really tasty gluten free snacks! Before I had to go to a fancy grocery store like Whole Foods or my local PCC, but now I can purchase them at most grocery stores or online. 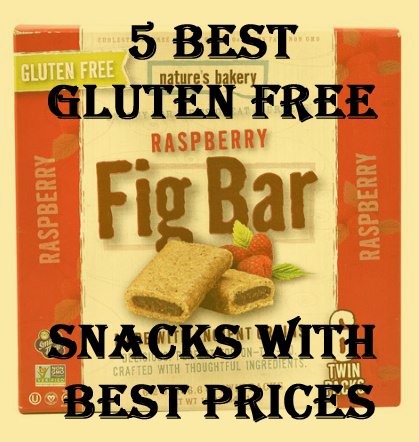 Here are 5 of my latest discoveries of the best gluten free snacks in my opinion and where to get them for the best prices online. Nothing like coming home to a package full of delicious gluten free snacks waiting on your doorstep! These bars are cut in half, which makes them feel more like a fig newton. So it is like having a little cookie snack! Yes, they are fantastic with coffee! And also yes, they do have sugar in them. However the 4% of your daily fiber somewhat makes up for it. So maybe go with the black coffee because the 10 g of sugar are a bit high. As of now they come in three flavors, original fig, blueberry, and pomegranate. My favorite is the pomegranate it is sweet and tangy at the same time. My kid loves them and it is a good snack for sharing since it is cut into to pieces per bar. Then you can say you only had 5 grams of sugar! As for where to get them for the best price, they are surprisingly hard to find. 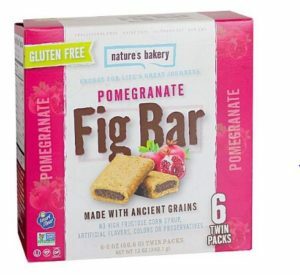 Target has boxes of 6 for $3.99(click here to see it), but as of now they only sell fig and pomegranate flavor. If you a member of Thrive.com you can get a box of 12 blueberry bars for 8.95 and Walmart for $7.74. The prices at Walmart change a lot though, so it is hard to say what it will be right now. There is always good ol’$4.99 a box for blueberry as of now (click here to see it). Raspberry is the hardest to find. I found it on Vitacost.com for $4.84. I didn’t even know it existed because it doesn’t come up in search other than Nature’s Bakery’s actual site. As of now, none of these links are affiliate links. Be careful when purchasing these as the same company make a whole wheat version which is much easier to find and less expensive of course. Double check that it says gluten free. The packaging is also different it is swhite with color on the sides, like the picture, and says gluten free in the top corner banner. All in all they are delicious and they last for a long time in your purse. You can feel like you are eating a cookie, but it is way healthier than that. They definitely are my number 1 for best gluten free and dairy free snack. These I have to hide from my kid because she wants to eat them all the time. They are delicious and surprisingly filling. They come in two flavors strawberry and blueberry. Strawberry is my go to, partially because it is more like a real peanut butter and jelly sandwich. I always had strawberry jelly in mine. The blueberry is good as well. They taste like a soft peanut butter and jelly sandwich with extra jelly. These are more moist and soft than the fig bars, but they are also more sugary and have more fat. With 14 grams of sugar per bar and 9% of your daily fat it can be a hard sell for an adult some days. Although 8% of daily fiber beats out the fig bar. Which is hard to believe since the fig bar has figs in it! I am sure my kid would pick these over the fig bars any day, but that is probably due to the sugar. For me the fig bars win most days, but we all have our days we want a sweet pick me up. As for where to get a good price as usual Target.com $3.99 and Walmart.com $3.98 are the winners, but they only have strawberry. So if you prefer blueberry there is always Amazon.com $.569 or Luckyvitamin.com $5.67. Again, these are not affiliate links and the prices are from time of writing and may change. This popcorn is addictive! It delicious and has that perfect sweet and salty balance that is the hallmark of a good kettle corn. I try not to buy it too often because I know I will eat it all. My family doesn’t prefer kettle corn they like regular popcorn, so I know it will be all me. That doesn’t stop me from getting it when I go past it at Costco! It isn’t the best for you a serving size is pretty large at 2 cups, but 12% of your daily fat and 16 grams of sugar is a lot for a snack. I guess the 16% fiber helps me feel better about it, but really it doesn’t do much to fill you up so it is definitely a treat snack. It is pretty easy to find, I have seen it at Costco and Safeway. Best price so far goes to Walmart.com for $2.78 on the 7 oz size. The nice thing about buying it as Costco is it is a larger size and has a resealable top. So, if your family will help you eat it before it goes bad, the Costco size is probably best. Other bonus this food is also GMO free, which when it comes to corn, is pretty important these days. This is the prefered popcorn of my husband and toddler. They both go nuts for it and always want to ruin their dinner by eating bowls of it right before dinner time! It is hard to say how great the nutritional values are here. If you go by their info it is 39 calories per cup. That is better than a lot of popcorn. But then it says a serving is 48, but I am not sure exactly what that is, it isn’t ounces so it must be pieces. This makes it hard to compare to other popcorns because they don’t give nutritional info by the piece. Evidently it also comes in White Cheddar, Jalapeno, and Dusted Chocolate flavor, but I don’t think I have ever noticed these on the shelf. I doubt we would buy them anyway, but is always nice to know there are options. As for pricing Walmart.com wins again at $2.83 for the 4.4 ounce size. I know that doesn’t sound like very much popcorn, but popcorn is mostly air anyway. Additionally, this popcorn is of course Gluten Free Certified, Non-GMO, and Kosher. Also, it is nut free, which is pretty important if you are allergic to nuts. I love these crackers. They are rosemary intense in flavor. They are also vegan, paleo-friendly, grain free and soy free. They are made with nut and seed flour blend as well as cassava which I haven’t seen in many gluten free crackers. The nutritional facts aren’t too bad, almost no sugar although 12% of your daily fat in 13 crackers isn’t great. They do however have almond and cassava in them so they are 8% of your daily fiber and curiously 10% of your daily iron. My only complaint is that they are a little pricey for such a small amount. I got them at my local PCC grocery store and I see them online at thrive.com for about the same price, currently $4.45. While expensive they are well worth the splurge once in a awhile. I have to say being able to eat a cracker that actually tastes like a real cracker is pretty amazing. It has been a while since I found one that really fit that true cracker mouth feeling and flavor button. They are of course Certfied Gluten Free as well as GMO Free, and Kosher. They are also a go for the Paleo diet and are vegan and vegetarian as well. While the online prices are good and it is convenient especially if you do not live near the store it is often less expensive to purchase in the store, especially for places that charge shipping if you don’t want to spend their minimum for the free shipping. Target.com is great if you have a target credit card you get 5% off and free shipping on everything. Walmart started their new $49 to get free 2 day shipping and Amazon of course has Prime. However, Target in store often has coupons for things like get $10 off $50 of groceries and if you plan on getting foods they don’t offer online in the store this can really work out for you. Plus if you use your Target card in the store you still get your 5%, but you have to pay for gas and of course take the time to go down there. Again, I am not an affiliate for any of these things. This is just what I do to try to get the best price on gluten free snacks. There are more options now, but they remain more expensive than regular snack foods. The silver lining is that they tend to be healthier than most snack foods as well.